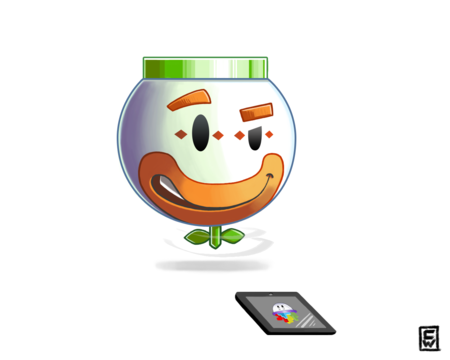 During Community Love Week, GameSalad is excited to present a Bowl Boy Fan Art Competition! Beginning today, Monday March 26th, members of the GameSalad community are encouraged to submit a piece of Bowl Boy fan art. The GameSalad community will vote and the winner will receive a free, one year Professional membership. To participate, get creative and design your best Bowl Boy inspired image. Please submit files via JPEG images via email to community@gamesalad.com. All submitted Bowl Boys will be uploaded into a Bowl Boy Contest Facebook Photo Album. To vote for your favorite Bowl Boy, just “Like” the picture with your favorite Bowl Boy inspired art. We encourage all users to submit. If you already have a pro membership, no problem! In the event that a current Pro Member wins, their membership will receive a free one year Professional membership extension. We will accept Bowl Boy art submissions through Friday March 30th at 10 AM CST. And that time we will close the submission process. Votes will be tallied at noon CST. Winner will be announced via Facebook and the GameSalad blog on Friday March 30th. Need inspiration? Check out this Bowser Bowl Boy fan image created by GameSalad’s UX Designer, Cooper Welch. Get creative and we can’t wait to see what you come up with!